Tell me how you play and I will tell you who you are. Were you to journey to Brazil and ask a local to sum up the nation’s soccer identity, you’d probably hear something about o jogo bonito (the beautiful game) or perhaps ginga (creativity), revealing that the nation is forever in search of Pelé’s beautiful game. For example, as a teacher in Brazil, I could threaten students with the phrase ‘you’ll have to play defense during PE’ as a deterrent for bad behavior. The effectiveness of that one statement might explain why some Brazilians have been exasperated by the style of current manager Dunga. Today, FFG breaks down Brazil’s current formation to find out whether or not it’s an antithesis to the beautiful game. On paper, Brazil’s formation most closely resembles a 4-2-2-2, but Dunga’s squad sometimes seems to be playing a 4-2-3-1 or a 3-5-2. The lineup’s shape is determined by fullbacks Maicon and Michel Bastos, much like how the movement of Landon Donovan and Clint Dempsey influences USA’s formation. Both Maicon (who some say is the best player in the world, not just the best fullback) and Bastos (a converted left winger) bomb forward whenever they want, and unlike many teams, they do so at the same time. They’re able to move forward together because one of the defensive midfielders will drift back to cover, ensuring that there are always three deep defenders. The fullbacks are so proficient in attack that Dunga’s squad doesn’t have to use traditional wingers. Instead, two attacking midfielders roam the middle of the pitch. Of the two, Elano is more circumspect in his movement, rarely straying out of the midfield, while Kaká has the freedom to move wherever necessary. Up top, Luis Fabiano’s number nine shirt reveals his role as the conventional center forward: he’s the man who should score the most goals, as the attack is designed to funnel the ball to him. Fabiano’s enigmatic but talented partner Robinho plays a hybrid winger/striker, moving closer to or farther from Kaká as he sees fit. 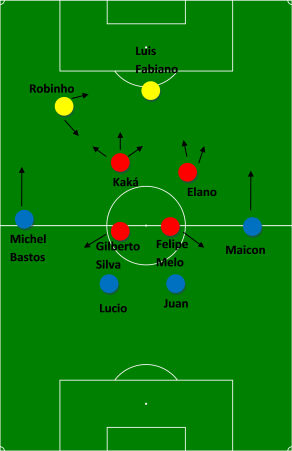 Defensive midfielders Gilberto Silva and Felipe Melo position themselves just in front of center backs Lucio and Juan, and the four provide the steel to Kaká and Robinho’s silk, with Silva a bit more defensive than Melo and the latter going forward on occasion. In fact, Silva sometimes drops back to fill Lucio’s spot: the Inter Milan center back fancies himself a forward and once or twice a match will push all the way to the opposing penalty area! Normally, Lucio and Juan play a high offside trap and either Silva or Felipe Melo join the defensive line if both fullbacks have ventured forward. While the formation has four players whose first duty is defense, can a side fielding up to six attackers at once truly be defensive? And that’s without mentioning the attack-minded center back! Contrary to popular belief, the beautiful game is alive and well. Gringos, what do you think? Is Dunga’s formation attack-minded enough to sate even the most glutinous soccer fan? Addendum: Brazil will not field the above starting eleven on Friday (the formation should be the same, though). Felipe Melo and Elano are both injured. Dani Alves is the likely replacement for Elano (that’s right – Brazil uses the 2nd best right back in the world as a midfielder) but Melo’s understudy is not so clear. Against Chile, Ramires started in his place, but he will be suspended for Friday’s match. Personally, I hope that Kleberson sees the pitch. In 2002, while I was visiting the midfielder’s hometown, I jokingly introduced myself as Kleberson, much to the delight of the people I was meeting, who happened to be his friends. you know, if you were my teacher and told me i’d be playing defense, i would just have misbehaved more. i love playing defense!